Note: This is not for those using Advanced Compounds for creating a compound but can be used to help manage and configure compounds. The main difference when adding a compound versus the regular product is to change the Compound field to ‘Y’. Once changed to ‘Y’, the Compound link will become active. The remaining fields on this main screen are the same as in the regular product. Click on the Compound link to add ingredients and additional compound information. GCN SeqNo: An optional field to assign a GCN sequence number. Click on the underlined label name to access the find screen. 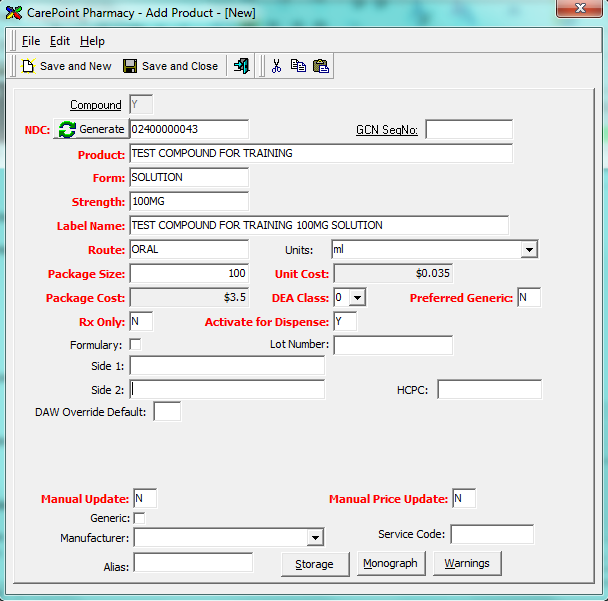 Search for an equivalent product and select to assign the GCN. Also when this is assigned, it will automatically add the necessary warnings . Product: Enter the name of the product. Form: This is what form the product is in, such as Capsule. Strength: Add the strength of the product here. Label Name: This field will auto populate once the Product, Form, and Strength fields are populated and you tab off the last. You can change this as you see fit for what you want to be printed on the label. Route: Enter the way in which the medication will be administered. Units: From the dropdown select the appropriate unit of this drug. Package Size: Enter the total units per package. Package Cost: This will be calculated once you begin adding ingredients. Unit Cost: This will auto calculate based on the values entered for package size and cost. DEA Class: Select the correct DEA class from the dropdown. Preferred Generic: If you need this product to be a preferred generic to set this field to ‘Y’. It will be defaulted to ‘N’. Preferred Generic will cause the Dispensed Drug to default to this product if the Drug Written is its brand. Rx Only: Setting this to ‘Y’ would only allow this product to be dispensed as a prescription. You would not be able to add this as an OTC or non-rx entry to an order. Activate for Dispense: When entering a new product this will default to ‘Y’ to allow the drug to be used during dispensing. Formulary: Check this if the product is a formulary drug. Lot Number: Enter a lot number on the product level if need be, or if you are not using inventory management. Side 1: This would be what is displayed on the first side of the drug and can be used on the label. Side 2: This would be what is displayed on the second side of the drug and can be used on the label. HCPC: Add a HCPC code to this product if needed for billing purposes. DAW Override Default: If you need to have the DAW default to a certain value for this drug while dispensing, enter that value in this field. Manual Update: This will default to ‘N’, but if changed to ‘Y’ then when the FDB clinical updates are loaded each week, this product would not be updated and any clinical updates to the product would have to be manually updated. Manual Price Update: This will default to ‘N’, but if changed to ‘Y’ then when the FDB price updates are loaded each week, this product would not be updated and any pricing updates to the product would have to be manually updated. Generic: Check this box if you are entering a generic product. Manufacturer: From the dropdown select the manufacturer of the product. Service Code: If there is a service code associated with this product, enter it here. Alias: If you wish to search for your products using an Alias, this is where the alias would be set. Searching by alias would also need to be turned on in Administrator. Storage: Clicking this button will open a free text area to enter in any information about storage of this product. Monograph: Clicking this button will open the Alternate Product Monograph. For each type of Monograph needed you will add the content of the monograph and set to Active. If left blank, the monograph will default to what is set by First Data Bank or stay blank. Warnings: You must have a GCN Seq No set for this to be accessible. This section is where you can link this product to available warnings offered by First Data Bank. 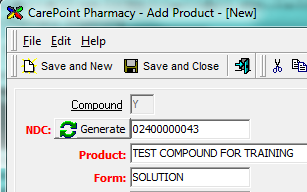 When the Compound link is clicked the Compound Product screen will appear. The top Product Information section is what was entered on the first screen and cannot be edited here. Set the Compound Type and Route of Administration by selecting the appropriate option from the dropdown. In the Ingredients section click the ‘Add’ button to add a new ingredient. Red field are the required fields. Product: Type in a name or partial name and tab to open a search screen. Find the drug you want to use as an ingredient and select. Quantity: Enter the quantity of this product used to create this package size of the compound. Strength: Add the strength of the ingredient if needed. 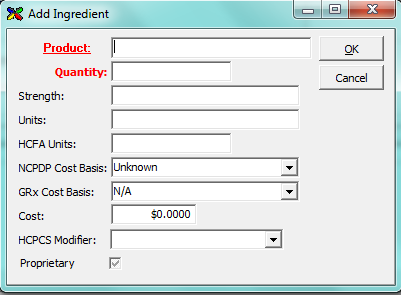 Units: Gives the option to add the number of units for this ingredient. 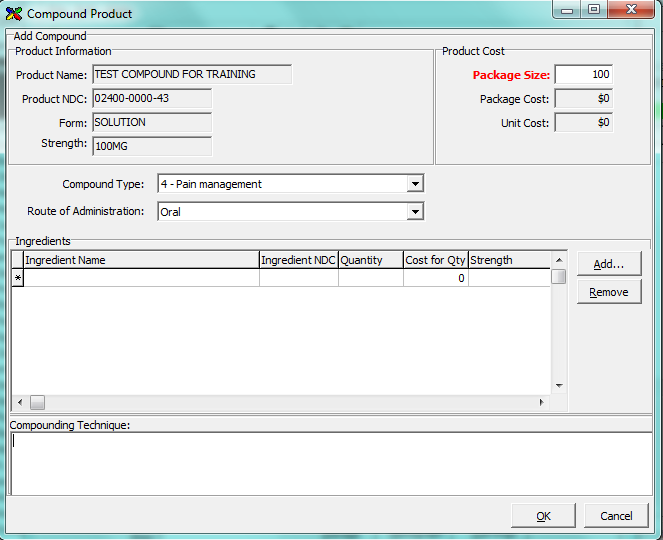 HCFA Units: Gives the option to add the number of HCFA unites required for the ingredient. NCPDP Cost Basis: Choose from the dropdown what type of cost basis you want to use in calculating what will be sent to the third party during adjudication. GRx Cost Basis: Choose from the dropdown what type of cost basis GuardianRx will use to calculate costs. HCPCS Modifier: If needed, add a HCPC code here. Proprietary: If this option is checked, this ingredient will not be sent to the third party for billing. Once an ingredient is added, it will then be populated in the Ingredients section.